"Rocky Horror" meets "Cuckoo's Nest"
A few years back I found myself with a number of songs that just didn’t fit on any album. Songs about the state of the world, about hunger, about government cover-ups. One such song, Meat Street, talks about a planet that’s lost its soul. It describes what life is like when people consider themselves to be "meat." (A human body without a soul is, after all, basically meat.) It didn’t take a rocket scientist to figure out that the world was going down the tubes. But what could I do to help mankind? I racked my brains and did some real meat searching—I mean soul searching—and finally came up with a plan. I’d take those songs, add new material, and write a smash Broadway musical. So, welcome to planet Earth. Welcome to Meat Street! Over the next five years (between producing music for NBC, CBS and hundreds of commercials) I spent every free minute recording the music and writing the script. The first few attempts were depressing. I wasn’t depressed—the people who read the script were. It was a very dark comedy. So dark, In fact, some actors joked about slitting their wrists. The story definitely needed more hope. And hope is what it got. Meat Street follows the lives of Tony, Danielle and Flo—three close friends trying to survive in a troubled world, and a psychiatrist, Dr. Richard Frick. Through various turns of events, Danielle, Flo, and Tony all end up in Dr. Frick’s clinic: Happy Hills— A Home for the Mentally Unique. Next, in order to promote the play and get people interested in producing it, I released the double CD set of the score and had it distributed to show music stores. The CDs got great reviews and several show music hosts "intrigued by the concept" played Meat Street on their programs. Then the phone calls began. We had magazines, producers, actors, and fans all calling up to find out more. 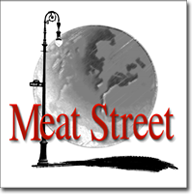 Although the story of Meat Street is fiction, the quotes and other elements used throughout are real or based on fact. Some of these things will make you laugh; others will shock you. All are guaranteed eye-openers, and that’s good. The world will only improve if we face it with our eyes wide open, see what’s really going on, and then do something to fix it. And that’s what the play is basically about: people coming together to "help." Helping the planet, helping each other. And Meat Street is my way of doing something to help. I want you to be entertained. And, I want to give you something to think about. So here’s to turning this planet around. Here’s to a better world. 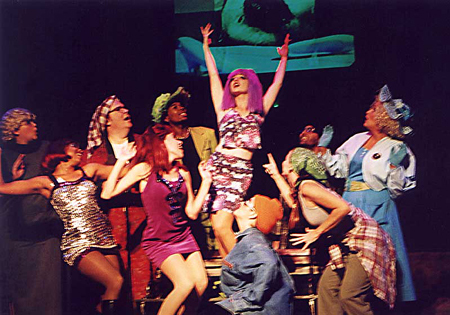 Original production in Orlando, FL. Produced and directed by Scott Cook.